I love these little spiders! Not only do they taste good, they're just the right thing for a Halloween Party or pre- or post Trick or Treating. After I grossed everyone out last year with my Chicken Scary-aki witches' fingers, I thought I'd better reel it in this year. 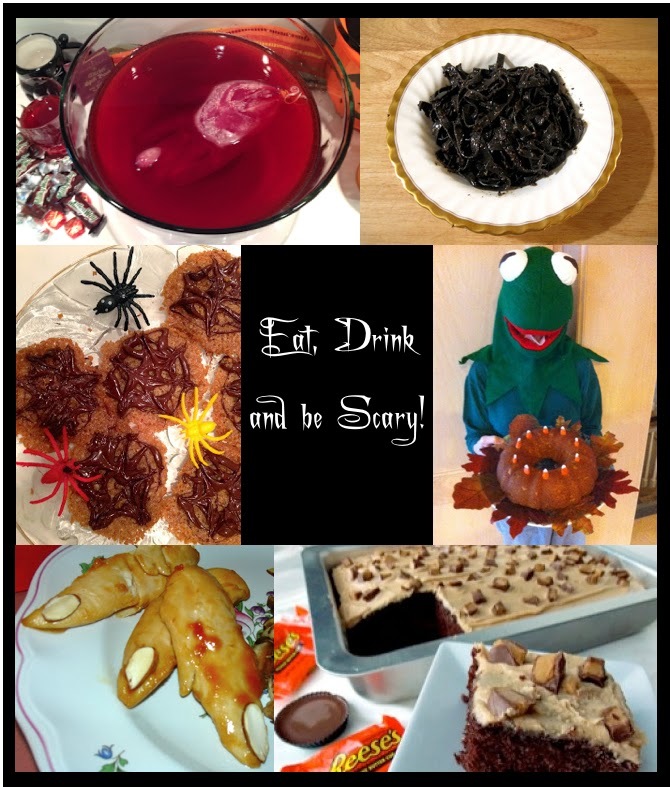 By the way, have you seen our favorite Halloween recipes from past years? Oops, there are those pesky fingers again! Bwahahahaha! Even though Deviled Eggs are about as old as it gets, people seem to go nuts for them whenever they're served. These are easy peasy to make. 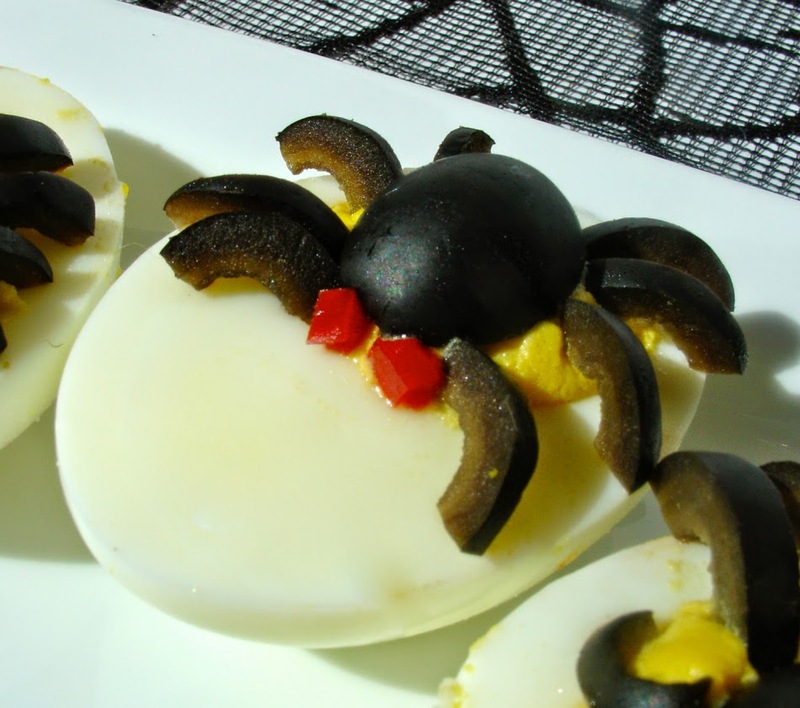 If you have a junior sour chef, enlist his or her help for creating the spiders. Use your favorite deviled egg recipe or just mix mayo and mustard with egg yolks until you like the taste and consistency. My only real advice is to use relatively small pitted olives. I first tried this with jumbo olives but they're way too large, even for extra large eggs. The spiders are every bit as cute without eyes, so you can skip that part if you're pressed for time. Hard boil eggs. Slice in half. Combine yolks, mayonnaise, and mustard until you achieve the taste you like with the right consistency. A mini food processor will speed up that part if you're making them for a crowd. Place a dollop of the yolk mixture in the center of each egg. Slice olives in half. Use a half for the body of each spider. Slice the remaining halves into legs. You may need to shorten them a bit. Press 4 legs on each side of the spider's body. Cut pimentos or red peppers into tiny eyes and press onto one end of the spider. This was my year of backward release dates. In June, THE DIVA WRAPS IT UP, a Christmas season mystery, was released. And now, THE GHOST AND MRS. MEWER, set at Halloween, will be out in December. Sigh. Of course, that won't stop Buttercup, Sunny, and me from talking about it nonstop. 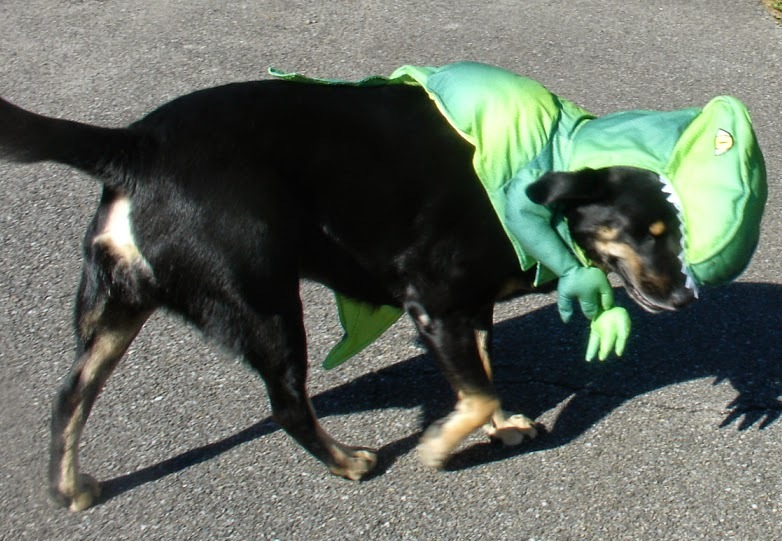 Buttercup gladly posed in her Halloween costume. Though she's a little bit concerned about that evil shadow looming over her! Baron wasn't as excited about dressing up. 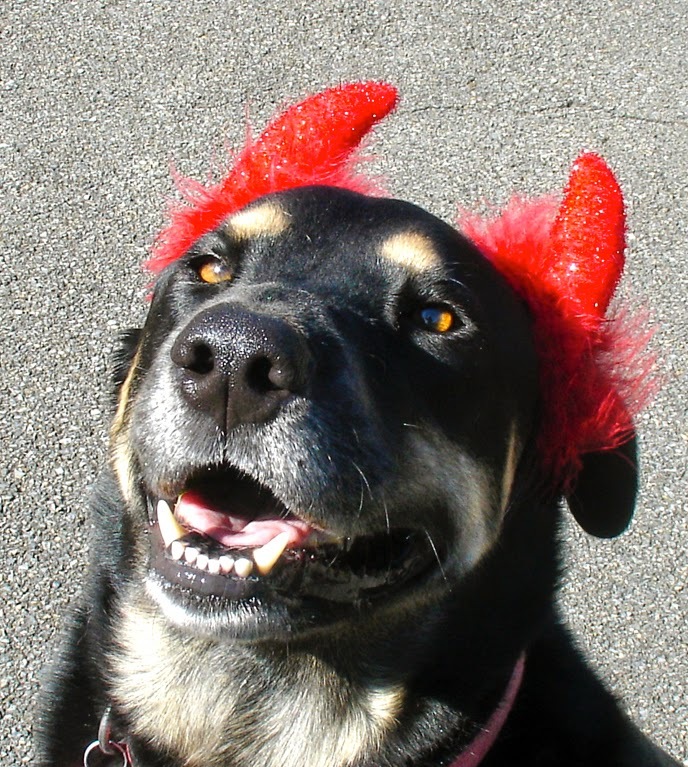 Baron made quick work of his costume but, when asked nicely (a treat may have been mentioned), he was willing to don devilish horns for 2 minutes. 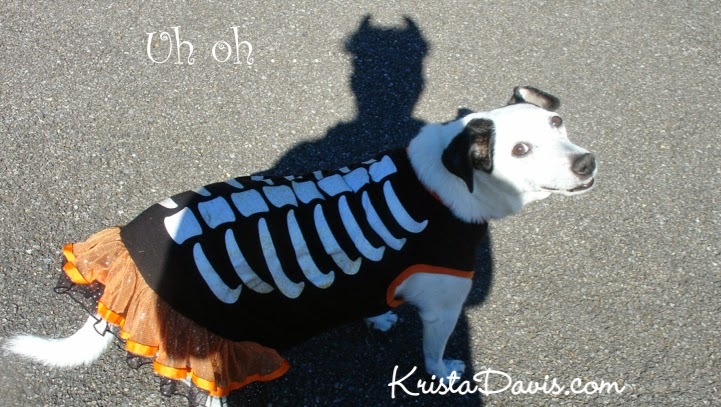 What fun, Krista! I love the look of these spiders. 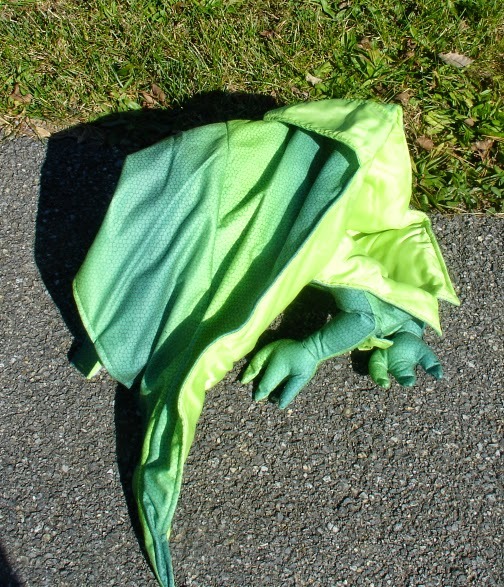 And the costume 'change' is hilarious - the case of the disappearing dragon? Thanks for starting my week with a smile. I love The Case of the Disappearing Dragon! What a great title! What a darling costume! I hope Baron will decide it's okay to dress up one day. I'll let him know he has a sister out there! These are too too cute! I will have to try these with my granddaughter! I think she'll love them, Peg! And no guilt if she snacks while helping! 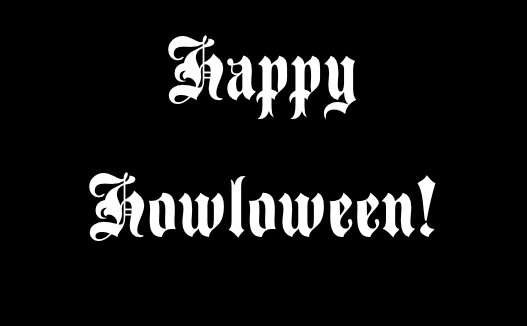 Happy Howloween to you, too! Well, you can see that Baron was less than thrilled. Buttercup is such a doll about these things. LOL! You notice there are no photos of my Golden. She was having none of it! So cute and so simple--my kind of thing !! Mine, too, Ronna! And it's some real food to offset all that sugar. Ohhhh! A perfect match, Cleo. Brilliant! .You ladies do such a great job with this blog. I enjoy it so much. 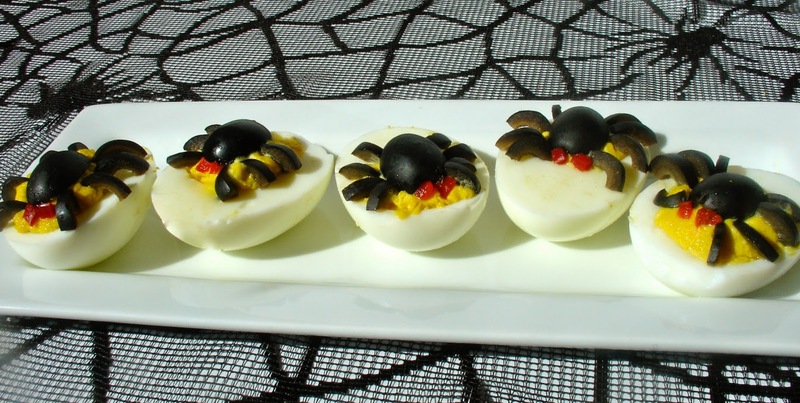 The deviled eggs with the olive spiders is adorable. It is amazing how deviled eggs has weathered the times and is still so popular isn't it? And compared to many snacks that is a healthy choice for kids especially. Thank you for the fun you give your readers in this column and for all the fantastic books that all of you write for us all.. Thank you, Cynthia. We try to keep the blog interesting and useful. I'm also impressed by the staying power of deviled eggs. Every time I make them, they fly off the plate! Very cute! And I love the shadow with the horns. Welcome back, Libby!!! Thanks, I like the ominous shadow, too. Heheheh.